In France and the Francophone world, the hostilities of the on-going Israeli-Palestinian conflict are consistently reenacted in cultural clashes between the large Muslim and Jewish populations within France and throughout the Francophone Diaspora. The notable scholars appearing in this collection interrogate the complex history of this conflict – from the beginnings of Zionism in 1897 to the first and second Intifada of 1987 and 2000 – and give unique perspectives culled from a diverse range of literary, philosophical, historical, and psychoanalytic frameworks. 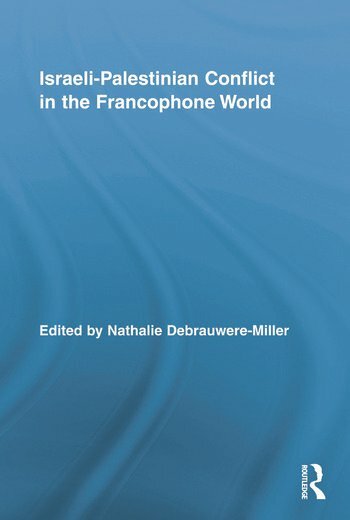 An important and unique volume, Israeli-Palestinian Conflict in the Francophone World, will shed new light for the reader on the dense ideological antagonisms at the heart of the Israeli-Palestinian conflict and will surely be celebrated as an invaluable resource for scholars, students, and teachers alike. Acknowledgments. Introduction: France and the Israeli-Palestinian Conflict. Nathalie Debrauwere-Miller. Part I: Alternative History of Zionism and the Jewish Question (1914-1950). 1. Tracing the Shadow of Palestine: The Zionist-Arab Conflict and Jewish-Muslim Relations in France, 1914-1945. Ethan Katz. 2. The Paradoxes of Zionism in the Work of Albert Cohen. Philippe Zard. 3. "One Nation (In)divisible? :" Sartre and the Jewish Question. Lawrence R. Schehr. Part II: Francophone Literature and Cinema on the Conflict (1957-2000). 4. Slimane Benaïssa or the Voice of Dissidence. Cyril Aslanov. 5. The Israeli-Palestinian Conflict in France: A Conflict in Search of Novelistic Representations. Annie Dayan-Rosenman. 6. When ‘l’essence arrose de haine:’ The Reinvention of Identity in Francophone Tunisian Literature. Lamia Ben Youssef Zayzafoon. 7. Otherwise Occupied: The Israeli-Palestinian Conflict in the Francophone Cinema. Lincoln Z. Shlensky. Part III: Violence, Martyrdom and Terrorism (1970-2007). 8. The Agony of Justice. Fethi Benslama. 9. Out of Palestine: Jean Genet’s Shooting Stars. Bruno Chaouat. Part IV: Muslim-Jewish Relations in France (1990-2008). 10. The War Comes Home: Muslim-Jewish Relations in Marseille during the 1991 Gulf War. Maud S. Mandel. 11. Hung up on Being Fair and Left Hanging between the Israeli-Palestinian Conflict and the "Banlieues". Johann Sadock. 12. Jews and Arabs in Postcolonial France, a Situated Account of a Long Painful Story of Intimacy. Nacira Guénif-Souilamas. Part V: Judeocentrism, Anti-Semitism and French Intelligentsia (2000-2008). 13. A New Judeocentrism? (On a Recent Trend in French Thought). Jeffrey Mehlman. 14. Dual Narratives on the Middle East Conflict: Analysis of French Literary Genre, 1967-2006. Denis Charbit. 15. How One Becomes a Traitor. Esther Benbassa. Contributors. Notes. Index. Nathalie Debrauwere-Miller is an Associate Professor of French and Francophone Literature at Vanderbilt University. Her research focuses on French Jewish Studies and feminist theory. She is the author of Envisager Dieu avec Edmond Jabès (2007). She has also published numerous articles and book chapters on Edmond Jabès, Emmanuel Levinas, Hélène Cixous, Marcel Proust, Maryse Condé et Simone de Beauvoir in the US, France and Germany. They appear in journals such as Modern Language Notes (MLN), Literature & Theology, French Forum, Romanic Review, Contemporary French and Francophone Studies/Sites, Dalhousie French Studies, and in éds Minard, éd. Lendemains and Presses Universitaires de Vincennes. She is currently completing a manuscript entitled La Crypte du père: Hélène Cixous, Sarah Kofman, Eliette Abécassis and Anne Goscinny.